Terry Sendgraff is a visionary choreographer, performing artist, and master teacher. She is a noted pioneer of Aerial Dance and the creator of Motivity, her innovative dance creation and performance style. In 1971, when Terry Sendgraff moved to San Francisco, there was no such thing as "Aerial Dance." In 1975, on the eve of her 42nd birthday, Terry introduced Motivity, and over the course of that decade, Aerial Dance emerged as a popular post modern dance genre. She obtained a bachelor's degree in Recreation from Pennsylvania State University (1955), and holds a master's degree in Dance from the University of Colorado at Boulder (1969), as well as a master's degree in Clinical Psychology from John F. Kennedy University (1986). In addition, Terry has extensive training in modern dance, ballet, gymnastics, and awareness oriented dance/movement forms. Since 1971 she has created over two hundred concerts, including her unprecedented A Year of Sundays (1977-1978) and her celebrated birthday performances from 1974-1983. 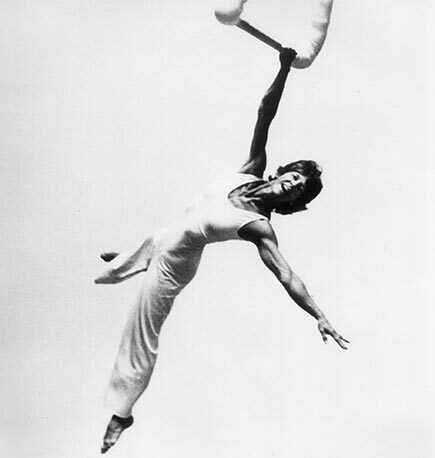 From 1978-1980 she founded and led Fly By Nite, the first women's trapeze dancing troupe in the country; it gave sold-out performances at the Motivity Center in Berkeley. From 1991-1994 she founded and directed Women Walking Tall Stilting Troupe for the purpose of empowering women and girls of diverse economic and cultural backgrounds. She established her Motivity Company in 1980. She has collaborated with many Bay Area performing artists and companies, including Anne Bleuthenthal, Kim Epifano, Shakiri, Wendy Diamond, Nina Wise, Joya Cory, Dance Brigade, AXIS Dance Company, and Run for Your Life Dance Company. She has been collaborating with musician Gwen Jones since 1975. Other musical collaborators include Carolyn Brandy, Debbie Fier, Jennifer Berezan, and Kayla Kirsch. Terry was a featured artist and faculty member at the Annual International Aerial Dance Festival in Boulder, Colorado (1999-2005) and received the Isadora Duncan Sustained Achievement Award in 2005. Her career was also featured in Dance Magazine in August 2005. Other career honors include an Isadora Duncan Solo Performance Award (1989), a Choreographer's Fellowship from the National Endowment for the Arts (1993-1994), Artist Residencies from the California Arts Council (1993 and 1994), a CA$H grant (2001), three Zellerbach Family Fund grants, and two Independent Artist Awards from Oakland Crafts and Cultural Arts (1999 and 2001). In 1989, PBS aired Can You See Me Flying: a Portrait of Terry Sendgraff. She was nominated for the Isadora Duncan Dance Innovator Award (1984) and the Isadora Duncan Award for Choreography (The Red Bed, 2001). Although she is retired from on-going teaching, she still choreographs and leads select workshops. She lives in Oakland and is writing her memoirs.